Doctor Who has always been at its best when it maintains an air of accessibility that allows long-time fans and newcomers alike to enjoy the programme in equal measure. However, with John Nathan –Turner as producer, the 1980s serials frequently relied on continuity to varying extent and success to drive their narratives forward. This had been increasingly clear as Peter Davison’s time as the Fifth Doctor progressed, but perhaps no classic serial relied quite so much on the past as ‘Attack of the Cybermen,’ that decision to alienate casual viewers made all the stranger given that home video releases of previous tales were not yet commonplace, that ‘The Tenth Planet’ aired some twenty years earlier, and that several episodes referenced were missing from the video archives at the time. 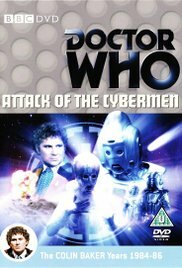 Indeed, ‘Attack of the Cybermen’ seems to exist solely for the most loyal fans. However, its frequent acknowledgement of long-past events, names, and places end up being rather trivial to events as a whole, and the lack of explanation to put this cascade of continuity into context effectively eliminates any chance of a newcomer or even a casual fan from enjoying and fully understanding the story. ‘The Tenth Planet’ aired in 1966 and predicted a Cybermen invasion in 1986, but it’s hard to imagine that the original writers could have predicted that Doctor Who would still be on television twenty years later or try to deal with the ramifications of what was surely intended as an obscure date in the future. By trying to tie events together, however, ‘Attack of the Cybermen’ only highlights visual discrepancies between the different eras and creates just as many gaps in continuity as it fills in along the way. There had also been a growing trend during the Davison years to try to offer more mature stories, again accomplished to varying degrees of success and too often relying on simply amplifying the grimness and brutality, and that also continues here. Unfortunately, whereas the Sixth Doctor’s loud persona seems to be a direct contrast to the more passive and optimistic Fifth Doctor, he never has the opportunity to prove himself as being any more capable of dealing with the more dangerous universe around him. With even the Doctor and Peri getting in on the violence, the gratuitous violence and bloodshed threatens to become the focal point of the serial rather than the plot itself. In fact, the character of Lytton is really thrust into the role of hero despite his own propensity for violence, and the Doctor is at time painted as incapable and one who survives merely by luck and the actions of others rather than by the consequences of his own deeds. Likewise, while it’s easy to see the shortcomings in the script and characterization that Colin Baker had to overcome for his character, Nicola Bryant also directly suffers for the same reasons, and Peri’s obvious fear of being around the Doctor despite his promises to change continues to veer as close to an- at least emotionally- abusive relationship that a family programme of the time would show. This, of course, is in direct contradiction of his steadfast refusal to conform to some sense of gentleness and normality from the audience’s perspective. The notion of the Cybermen exploiting time travel to change their own history is admittedly a clever central conceit for the story, but the need to tie together old adventures rather than using time travel to do something truly exciting and unexpected comes as a letdown given the potential. Similarly, with different Cybermen continuing to show varying degrees of emotion and individuality, the core essence of the race continues to be glossed over simply to have the iconic foes return once again. Even the idea of some people rejecting the brutal Cyber conversion process presents a unique angle to the Cyber menace, but unfortunately this is not explored enough to save a script doomed from the beginning. ‘Attack of the Cybermen’ very much marks Doctor Who looking to the past in order to find its way going forward, but it fails to do so in any sort of meaningful way and often gets lost and confused along its journey despite its ambition.